I hope you all are having a wonderful July 4th weekend, enjoying this perfect summer day. I made this last night and it was such a hit (not to mention ridiculously easy to make) I thought I would share the love. 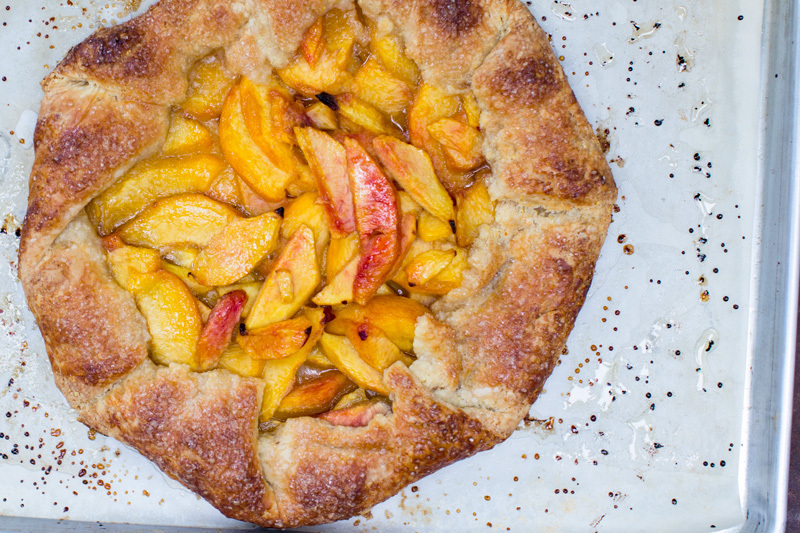 The key is obviously using whatever fruit is at its peak, perhaps mixing a few if you cant pick just one, but I think what wins over the crowd is the cornmeal in the crust – it adds a little sumthin that pairs perfectly with peaches. You could make this for tonight, Im not kidding its really that simple. Happy Summer!!! Combine the flour, cornmeal and salt in the bowl of a food processor and pulse once or twice to combine. Add the butter and pulse until the butter is about pea sized. Put an ice cube or two into your water to make sure it is very cold and combine with the vinegar. With the food processor running, drizzle in the water/vinegar and mix just until the dough starts to come together into a ball. For the dough into a disk and wrap in plastic. Refrigerate for at least 1 hour and up to 3 days. 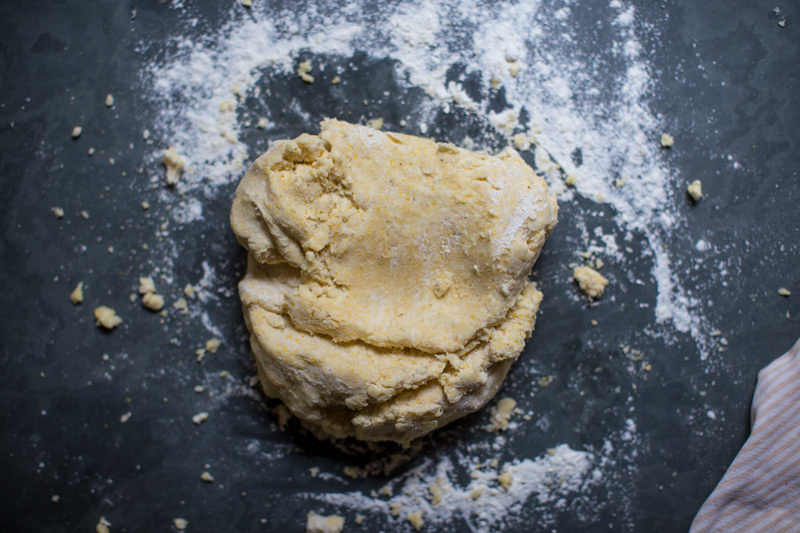 When you are ready to bake, preheat the oven to 400˚F and let your dough sit out on the counter for 10 minutes just to soften slightly. Roll the dough out to a 12" round (dont worry if the edges are jagged, this is a rustic dessert). Transfer to a rimmed baking sheet lined with parchment paper and chill while preparing the filling. Peel and slice the peaches - if they are underripe you can add a tablespoon of sugar - for ripe fruit I think sugar is unnecessary and makes the whole dessert too sweet but to each their own. Pile the fruit in the center of the rolled out dough, leaving about 2 inches around. 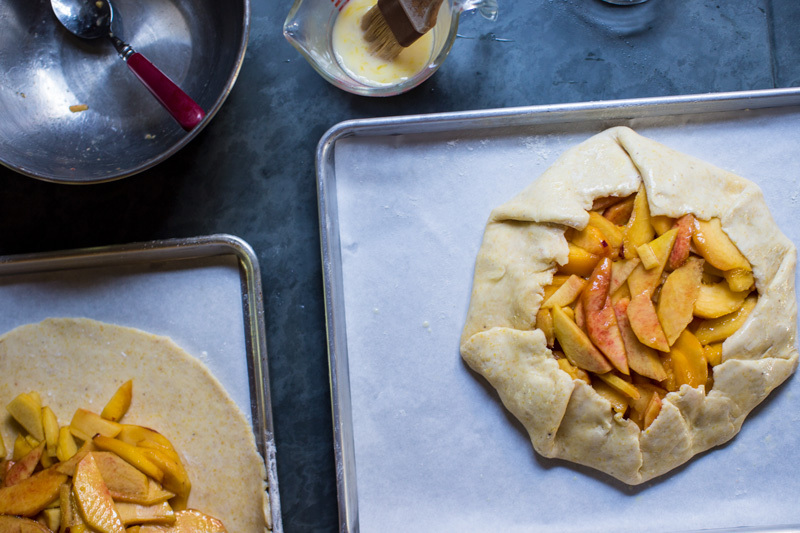 Gently fold the pastry over the fruit, pleating it every few inches to create a tighter hold. Lightly beat the one egg and brush over the dough - if any of the pleats are opening, use the egg wash as a kind of glue. 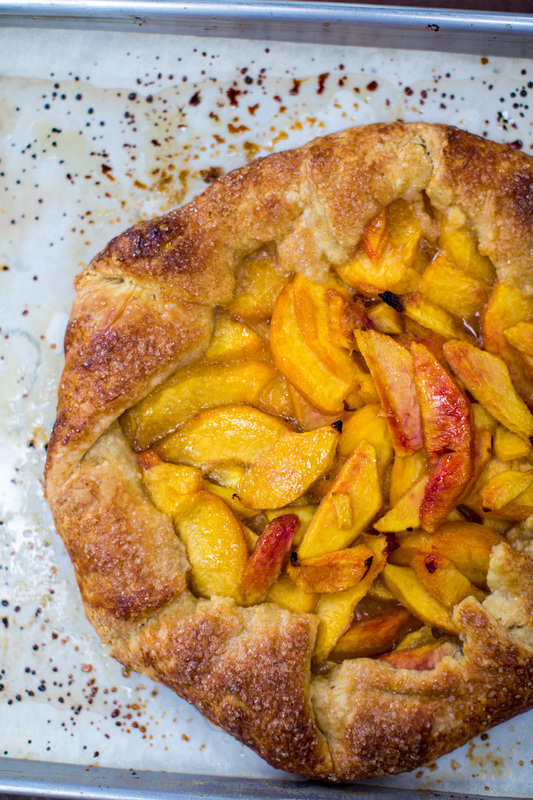 Generously sprinkle the raw sugar over the crust and put the tart into the oven. Bake for 30-45 minutes, rotating the pan halfway, until the crust is a dark golden brown. Let cool 15 minutes before serving.